[S1846] Andrew J. Leonard Cemetery grave marker, Holy Cross Cemetery, Colma, California, Photo provided by Sal Bigone, September 28, 2013. [S1850] Sal Bigone, "Andrew Leonard Jr. grave," e-mail to Elaine M. Beaudoin, September 29, 2013; 2:23 p.m.
[S50] Michael Madigan, Death Certificate. [S51] Margaret Madigan, Margaret Madigan, Death Certificate. [S791] 1880 US Census, Illinois, Cook County, Chicago, Washington, DC, ED 32, Sheet 12, Line 31, Margaret Fitzgerald Madigan is shown as age 74 on the 1880 US Census. 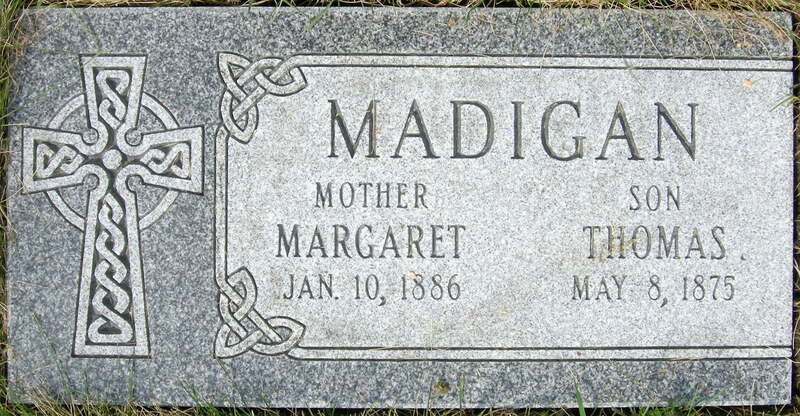 [S51] Margaret Madigan, Margaret Madigan, Death Certificate, Emmigrated from Ireland to the USA. [S780] Inter Ocean, January 12, 1886, Accessed October 21, 2007. [S2048] Interview, Sally Ruane Gilger, March 29, 2015. [S2053] April 21, 1911 Irish Census, County Mayo, Killaser, Cuildoo, Dublin City, County Dublin, Ireland, House #16, Irish National Library online, accessed April 2, 2015. [S2052] 1901 Irish Census, County Mayo, Killasser, Cuildoo, Dublin City, County Dublin, Ireland, House #16, Irish National Library accessed online April 2, 2015. [S2170] National Library of Ireland - Baptismal Registers, online http://registers.nli.ie/, Killasser; County Mayo; Diocese of Achonry, Baptisms, Aug. 1848 to Oct. 1848. Accessed November 9, 2015. [S2170] National Library of Ireland - Baptismal Registers, online http://registers.nli.ie/, Killasser; County Mayo; Diocese of Achonry, Marriages, March, 1866-February, 1867. Accessed November 9, 2015. [S2170] National Library of Ireland - Baptismal Registers, online http://registers.nli.ie/, Killasser Parish, County Mayo. [S2052] 1901 Irish Census, County Mayo, Killasser, Cuildoo, Dublin City, County Dublin, Ireland, House #16, Irish National Library, accessed online April 2, 2015. [S2050] Jame Ruane, Caronia Passenger List, September 10 - 18, 1907, Ancestry.com, accessed March 29, 2015, MF roll 0993, page 152, line 30. [S2170] National Library of Ireland - Baptismal Registers, online http://registers.nli.ie/, Killasser; County Mayo; Diocese of Achonry, Baptisms, Nov. 1867-Jan. 1868. Accessed November 9, 2015. [S2170] National Library of Ireland - Baptismal Registers, online http://registers.nli.ie/, Killasser; County Mayo; Diocese of Achonry, Baptisms, Dec. 1869-Jan. 1870. Accessed November 9, 2015. [S2170] National Library of Ireland - Baptismal Registers, online http://registers.nli.ie/, Killasser; County Mayo; Diocese of Achonry, Baptisms, June 1872-Oct. 1872. Accessed November 9, 2015. [S2170] National Library of Ireland - Baptismal Registers, online http://registers.nli.ie/, Killasser; County Mayo; Diocese of Achonry, Baptisms, Aug. 1874-Sep. 1874. Accessed November 9, 2015. [S2052] 1901 Irish Census, County Mayo, Killasser, Cuildoo, Dublin City, County Dublin, Ireland, House #16. [S2593] Christopher Fitzpatrick, Ireland, County Laois, Mountmellick, Deerpark death registration, Accessed February 6, 2018. [S2408] Eileen Sullivan, "Re: Happy New Year from Chicago," e-mail to Elaine Beaudoin, January 8, 2017. [S2411] Jane Anne Fitzpatrick, County Laois, Mountmellick, Barnadoes, Document provided by Eileen Sullivan, January 12, 2017 (August-December 1932). [S2412] Sullivan-Fitzpatrick marriage license, no. 6, registered April 26, 1957. [S2412] Sullivan-Fitzpatrick marriage license, no. 6, registered April 26, 1957: Document provided by Eileen Sullivan, January 12, 2017. [S2415] Jane Ann Sullivan, Division of Vital Statistics, Canada, Alberta, Edmonton, Certificate provided by Eileen Sullivan, January 14, 2017. [S2606] Eileen Sullivan, "Family Tree on Eileen Sullivan's FTDNA kit." [S2612] Joseph Fitzpatrick, Ireland, County Queens, Mountmellick, Baradoos birth registration Page 398, line 63; ID# 01914743, Accessed February 11, 2018 (August 24, 1889). [S2620] 1901 Irish Census, Coumty Queens, Mountmellick, Baradoos, Washington, DC, Form B. 2, Accessed February 11, 2018. [S2610] Mary Fitzpatrick, Ireland, County Queens, Mountmellick, Baradoos death registration, Accessed February 11, 2018. [S2611] Martin Fitzpatrick, Ireland, County Queens, Mountmellick, Baradoos death registration, Accessed February 11, 2018. [S2619] Ireland, County Queens, Mountmellick, Clonaslee marriage registration: entry for Martin Ftizpatrick and Mary Scully, November 11, 1886 IrishGenealogy.ie, Department of Arts, Heritage and the Gaeltacht, Ireland, Accessed February 11, 2018.